The following is a guest post from Angela Cox, a graduate student in English at the University of Arkansas. You can follow her on twitter at @KQscholar. Technological development is often conflated with creative possibility in videogames; arguments from players, designers, and scholars have suggested that as, videogames become more technologically capable of increasingly photorealistic representation, they also become more complex and interesting texts. But photorealistic gameplay is not the rhetorical power of the medium; gameplay is. While it is true that recent games are more constrained by genre conventions and economic reality than they are by technological ability, even the earliest games worked freely with gameplay as a rhetorical resources within their respective genre conventions. These conventions were (and still are) shaped by the usual processes of intertextuality as well as what Andrew Hutchison has called techno-historic limits. In this post, I look at examples from Space Quest I: The Sarien Encounter (Sierra, 1986) and Space Quest IV: Roger Wilco and the Time Rippers (Sierra, 1991) that demonstrate how the Space Quest series by Sierra On-Line leveraged conventions already deeply in place at the time of publication to achieve its parody effects, arguing that the parody functions primarily at the level of gameplay. In doing so, I claim that early PC videogames were not simplistic due to technical limitations, as is often assumed, but in fact drew on and developed rich textual and genre resources that were already recognized by the target audiences of the games. This rhetorical complexity makes historical PC games, such as Sierra On-Line adventure games, useful and fruitful objects of study, as well as possible models to guide current game design. Space Quest is markedly not subtle in its free and self-aware use of intertextual material. Specifically, the series makes use of parody and allusion to other games produced by Sierra, a signature trope that many Sierra games used. The Space Quest series in particular could make use of such tropes because the tone and setting of the games allowed for such self-referential acknowledgements of the artificiality of playing the game. The initial parody exists in the title itself: Space Quest plays off of Sierra’s flagship series King’s Quest. The word space in the title marks the game as decidedly science fiction, but the word quest attaches it to King’s Quest, a technique that is later employed by Police Quest to mark the game as clearly Sierra and draw on the prestige that King’s Quest had among Sierra’s fans at the time. At times, the parody and allusion in Space Quest is excessively obvious. 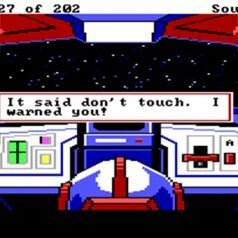 Consider, for instance, the case of the Don’t Push Button in Space Quest I. Figure 1 – Pushing the button that says “Don’t Touch.” You can view a video of this sequence here. The consequence of pushing this button is that the escape pod takes the playable character Roger Wilco into the world of King’s Quest, unfortunately landing in the moat with alligators. This Easter egg appears to be playing at the level of narrative—the joke here hinges on the player’s knowledge of King’s Quest’s setting, although interestingly the dialogue appears to be between Ken and Roberta Williams, the creators of King’s Quest, rather than between any characters from King’s Quest. But the humor also hinges on gameplay expectations in adventure games. Those players familiar with King’s Quest will know upon seeing the moat that it is a dangerous place—it is often the first way players find to die in King’s Quest I. More broadly, the button is nearly irresistible. It is only described as being labeled “Don’t Touch”, which is often an invitation for a player to touch something, because hero characters are usually exempt from such proscription (in both traditional narratives and videogames). But the gameplay of Space Quest employs a more realistic approach to the world for humorous effect. It subverts the expectations of players familiar with adventure games, showing how, in the real world with real world consequences, these actions would probably be a bad idea. It does this at the same time as demonstrating its hyper self-awareness of being a game: in this case, by having the player move between games and then having the game developers themselves inserted into the sequence. Still, this is a sequence that Sierra wants players to see. It requires a heavy investment on the part of the designers to insert into the game—in this case, it requires creating an additional room, a few additional sprites, and some extra logic code to make it all work. But the benefit is obvious: a plug for another game is free advertising for the company. If the player is already familiar with King’s Quest, then the sequence rewards him with the pleasure of recognition; if the player is not familiar with King’s Quest, then the association with Space Quest may be enough to interest the player. However, as advantageous as the Easter egg is to Sierra, it is nevertheless fatal to Roger, and requires that the player restore (if they remembered to save! ), restart, or quit the game. It is, in effect, a punishment at the same time that it is a reward. The “plug” is a convention in such games. Indeed, this one has a matching plug for Space Quest I in King’s Quest II: Romancing the Throne (Sierra, 1985). But the one in King’s Quest II is decidedly not fatal; indeed, the player is rewarded for it, not just with the pleasure of recognition or discovery, but also with a point, which makes it a necessary step in the game for any player attempting to complete the game with all points possible. 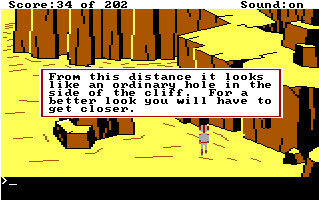 To encounter the plug in King’s Quest II, the player must look in the (rather obvious) hole on the top of the cliffs. 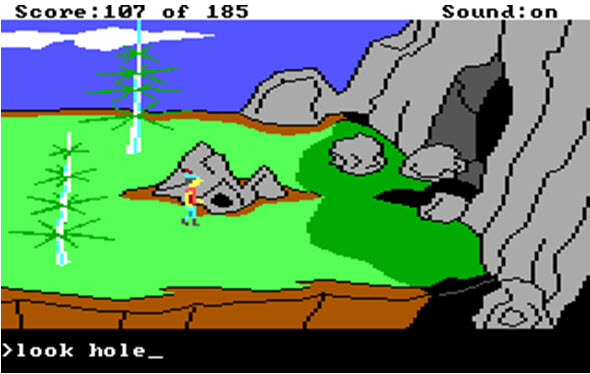 Figure 3 – the suspicious hole at the top of the cliffs in King’s Quest II. For a video of the full sequence, click here. By this point, the player is likely to have learned that looking in holes is a positive action, as similar holes have appeared in the mainland of Kolyma in the rest of the game: a hole in the rock by a lake contains a brooch, for instance, while a hole in a tree contains the mallet. Both objects provide points and both objects can be used to solve puzzles in the game, making looking in holes an unquestionably positive action in King’s Quest II. Thus, when encountered with such a hole again, looking in the hole is a rational action. In this case, the player receives not a useful object, but instead a full trailer for (the then upcoming) Space Quest I. The narration insists that this is negative, yet aside from being a period in which the player loses agency, there is no negative consequence to the trailer, only positive. 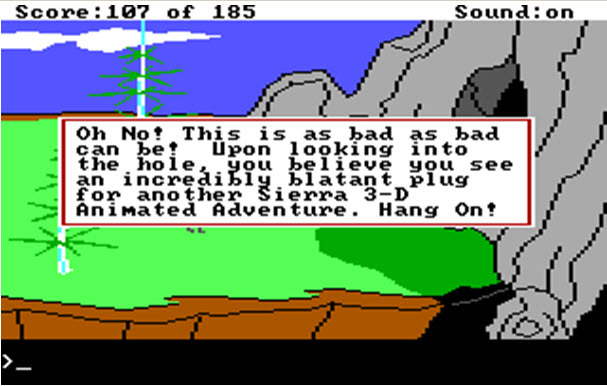 Figure 4 – The narrator comments on the technique of inserting “plugs” into games in King’s Quest II. This trailer, technologically speaking, requires a great amount of resource: seven rooms, sprites to populate them, and so forth. In the Adventure Game Interpreter Engine (AGI), there is no way to “simply” embed video, as we would do today, so to create a cinematic style sequence like this requires reproducing all the game elements and giving them supporting code to make them function in the ways desired. Nevertheless, the trailer exhibits features typical of cinematic trailers of the time: it begins with a title screen for the thing being presented, represents a voiceover using the printed narration at the bottom of the screen (drawing on the convention of printed narration already present in adventure games), employs a fast montage of action sequences showing the variety of settings in the thing being advertised, and concludes with a missive for the viewer. It is true that at this time, the videogame industry was still settling on conventions for advertising its works, but it fashioned the conventions we now see (such as videogame trailers) out of comparable media available at the time: here, the cinematic trailer, actually embedded into the game, despite the high requirement of resources to do so in the engine. As Space Quest was marketed to people who were already playing Sierra games—as we see in the case of the trailer in King’s Quest II—the players were reasonably expected to be familiar with gameplay conventions from other Sierra games and other adventure games in general. Much of the humor hinges on that familiarity. There is, for example, a hole on the planet Kerona in Space Quest I that looks much like the suspicious-but-rewarding holes in King’s Quest II (and many other adventure games). This hole behaves much like the holes that an experienced adventure game player at the time would know to look in to find hidden objects; if, for instance, the player enters the command “look hole” when Roger is not standing near the hole, the game displays the message “From this distance it looks like an ordinary hole in the side of the cliff. For a better look you will have to get closer”. 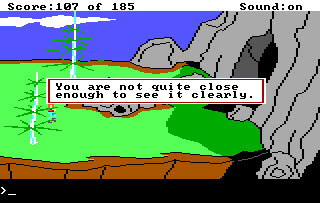 Compare this to the statement in King’s Quest II that serves the same function regarding the Easter egg hole: “You are not quite close enough to see it clearly.” These are conventional statements that serve at least two functions for the player: 1) they indicate that the hole is, in fact, something of interest to look at, because the game responds to it with a specific response and 2) they suggest that the player should get closer to the hole in order to inspect it more carefully as such inspection may be rewarded. But the hole on Kerona subverts player expectation and gameplay convention. When the player does, as the game suggests, and gets closer to the hole and looks into it, Roger is eaten by something inside the hole, resulting in a humorous death sequence. Instead of rewarding curiosity, as most adventure games at the time did, Space Quest I actually punishes this curiosity, saying “This should teach you to be cautious when encountering alien holes” (watch the full sequence here). Rather than adhering to gameplay convention, which makes such holes a convenient and often unquestioned means of embedding significant objects in the landscape, since such adventure games are very much based in spatial puzzle-solving, Space Quest I prefers a more realist approach that highlights the artificiality of adventure game conventions that are already, in 1986, recognizable and accepted by players. Of course looking in strange holes in an unknown environment is a questionable, at best, idea, for exactly the reasons that this hole on Kerona demonstrates, at least in the real world. Roger’s environment, though acknowledged frequently by the narrator to be a game environment, conforms to more realistic expectations with the effect of humorously highlighting where videogame conventions depart from realism. This pattern of representation continues throughout the Space Quest series. Space Quest IV: Roger Wilco and the Time Rippers, for instance, does the same kind of gameplay parody and subversion. The conceit of the game hinges on Roger Wilco being chased through time by “Sequel Police”; time is represented as episodic as Roger moves through various games in the Space Quest series, both past and future. In first sequence, set in “Space Quest XII: Vohaul’s Revenge II” has Roger in a postapocalyptic version of his home planet Xenon, in which he must scavenge items. Such search-and-find sequences are a common opening phase in an adventure game: it is typical for the game to start with nothing, or perhaps one or two items, in the inventory. In these cases, the experienced adventure game player knows to attempt to pick up everything not nailed down and, in some cases, take the nails and then take the thing nailed down, as it were. Such players are conditioned through gameplay conventions to expect that almost any object that can be taken early in the game should be, as it is likely to become significant by the end of the game, although it may remain in the inventory for the duration of the game. Generally, players, like readers of fiction or poetry, are conditioned to assume that if something appears in the text, it is significant, and this belief is reinforced with such conventions as awarding points for obtaining objects. One of the items available at the beginning of Space Quest IV is an “unstable ordinance,” found in a derelict tank. This is the only object of use in the tank. The tank itself has all the markers of a significant space in the game—it is close to the center of the screen on which it appears, it is foregrounded and stands out from the rest of the background, and has a suspicious looking hole in it where items might be found. The unstable ordinance also has all the markers of a useful object—it is the only thing of use that the narration mentions upon inspecting the tank, and taking it into the inventory awards points. Like the Easter egg in King’s Quest I, taking the unstable ordinance is encouraged because it is necessary in order to finish the game with all the possible points. It is also an object that seems to have potential—although realistically such a thing would be very dangerous, adventure game characters often obtain dangerous items (although they sometimes come with a timer) and use them in the course of their quests. With an enforcement robot and a zombie-like cyborg wandering around this space, an unstable ordinance seems like a very useful object. But the unstable ordinance actually has no use in any puzzles. If it is in the inventory when Roger enters the sewer, then it explodes, killing Roger and forcing a restore or restart to continue. The player must return the unstable ordinance to the tank where it was found; this action is also rewarded with points, and the narrator commends the wisdom of returning it. Here again we see the humorous realism subverting accepted adventure game conventions at the level of gameplay. 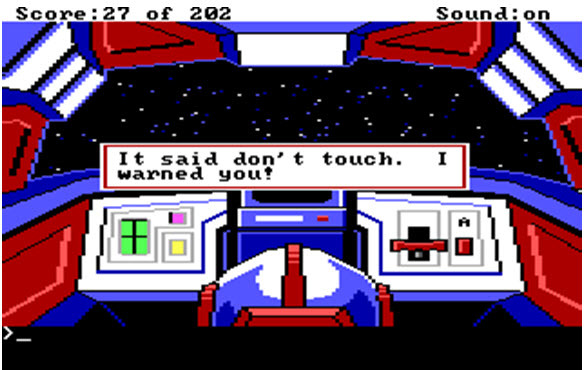 Actions that would ordinarily be rewarded in an adventure game, and are therefore desirable choices for the player, result in fatal but realistic consequences in Space Quest. When the player considers the game as mimetic, rather than as a game—even though the game constantly points out that it is a game, including the fact that the narrator says that Roger learns when he is by looking at the status bar and seeing the sequel that he is in—then of course keeping an unstable ordinance in inventory is a bad idea. In this case, the game rewards the player both for actions that are conventional to adventure games (inspecting the tank, taking the unstable ordinance) and for actions that are more realistically wise (putting the unstable ordinance back before it has a chance to explode). Space Quest IV also parodies adventure game conventions in the control structure itself. 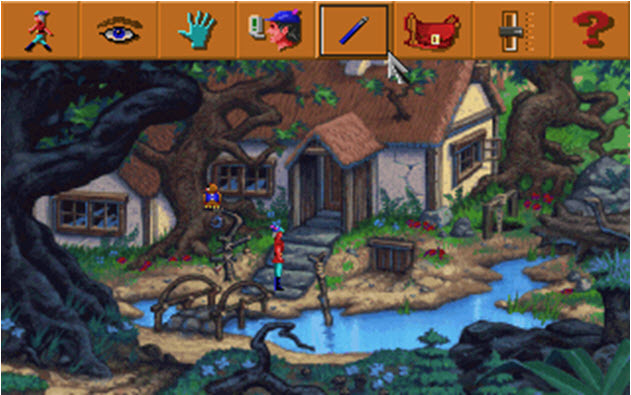 In conventional Sierra point-and-click adventure games of the time, such as in King’s Quest V: Absence Makes the Heart Go Yonder (Sierra, 1990), the player interacts with the game world through a selection of mouse cursors (chosen from a menu at the top of the screen). These icons pictorially represent common verb choices that would have been used in earlier parser-based interfaces: look, take, talk, use, for instance. The Space Quest IV control structure uses this conventional system, but with some modifications. In addition to the usual walking, eye, hand, talking, and object icons, it includes a nose and a tongue. The tongue and the nose icons serve little functional use in the game; they are an amusing option, but provide almost no necessary information about the game and are not used for puzzle-solving. Instead, in addition to being humorous in a very basic way (licking and smelling random things is funny, as indicated by the extensive remarks that these icons provide from the narrator and Roger), they provide a critical interpretation of the system of icons. It interprets them as verbs that represent senses through which the player can explore the game world. Thus, if the hand is touch and the eye is sight, then it is necessary to have the tongue and the nose to fill out all five senses and provide taste and smell. These additional icons also serve the same purpose of inserting arbitrary and unused things for the sake of realism that the unstable ordinance does. 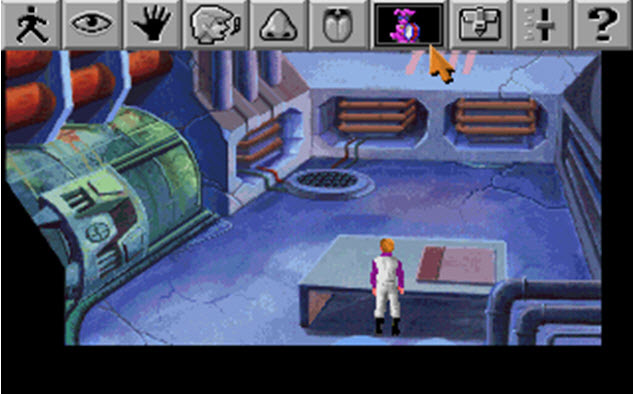 In real life, we can taste and smell things, but we actually seldom use these senses for puzzle-solving or to make things happen; in Space Quest IV, we see a mimesis of these sensory functions and a realistic portrayal of how these senses function in the real world—complete with the narrator interceding with objections when the player attempts to have Roger taste or smell something that should not, realistically, be tasted or smelled. As a self-aware text that uses realism and parody to highlight the artificiality of accepted genre conventions, the Space Quest series from its beginning functions in a similar way as much postmodern or deconstructionist literature, despite its usually being considered primitive owing to techno-historic limitations, or being dismissed as an object of serious study because its primary mode of criticism is humorous parody. Nevertheless, the game demonstrates how designers can and have from an early stage in videogame history both employed and subverted gameplay conventions to great effect. The rhetorical moves in Space Quest discussed above are resources still available and in use today, although of course the conventions to draw on have changed. It is worthwhile for us to examine the 20th century games closely both in order to understand the history of videogame genres and to use them as a source for synthesizing old conventions innovatively into new games. Other companies had other, similar, conventions for their adventure games in the 1990s. For instance, the player may be given a selection of verbs in the bottom part of the screen, and use the mouse to select from those. Most of these other interfaces are still adaptations of parser conventions, with the exception of certain innovative games such as LucasArts’s Loom (1990). Or any equivalent command, as the parser in AGI allowed for a wide variety of synonyms.